If you haven’t learned yet, I love beans! I sure do. They are such a perfect food in so many ways. They’re loaded with filling protein and fiber, making them delightfully nourishing. They are also incredibly versatile, which means they can be used in so many different ways! How you can you not feel joyous!? 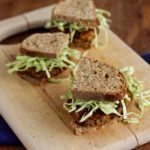 I especially love using them as the base in veggie burgers – they add moisture and act as a wonderful binding agent – important components to any bean burger. There are good bean burgers and there are well, not so good bean burgers. I’m guessing you’ve had both, right? While everyone has their own opinion on the matter, I think there’s a pretty good formula for creating an awesome bean burger every time. 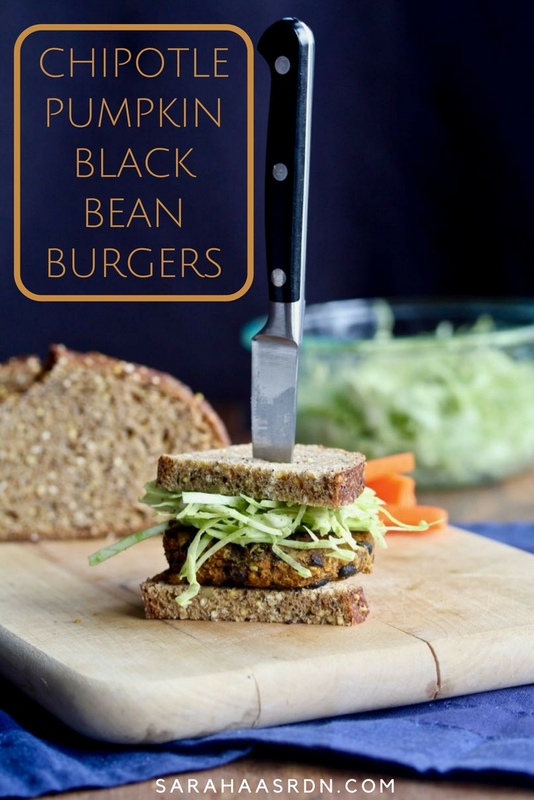 Here are my tips for achieving bean burger greatness! TIP 1 – Add crunch – That’s right, while beans add moisture and add “stickiness” to keep burgers together, they can also create a smooth mouthfeel, which can be off-putting. The solution? Add crunch! I like to do that by adding chopped nuts and seeds. Just that little crunch makes a huge difference. TIP 2 – Add flavor – Oh my, so many bean burgers are flavorless, so it’s no wonder people turn their noses up at them. Here’s the deal, beans can be really bland, unless you cook them from scratch. That means you’ll need to add seasoning. Go with bold flavors (like chipotle!) and plenty of aromatics like garlic and onions. Then please, pretty please, don’t forget the salt. TIP 3 – Add heat – By heat I mean the kind that comes from your stove. Get your pan nice and warm, add enough oil and leave those burgers be. Cooking them with this combination gives you a nice, crunchy golden exterior. That is pure bean burger perfection! Ok, now it’s time to set you free. Go ahead, you can do it! I promise. And while you’re at it, why not share your favorite bean burger recipe in the comments section below? Can’t wait to hear what you have to say and how you like these little bundles of goodness! Simple ingredients make a simply delicious burger. 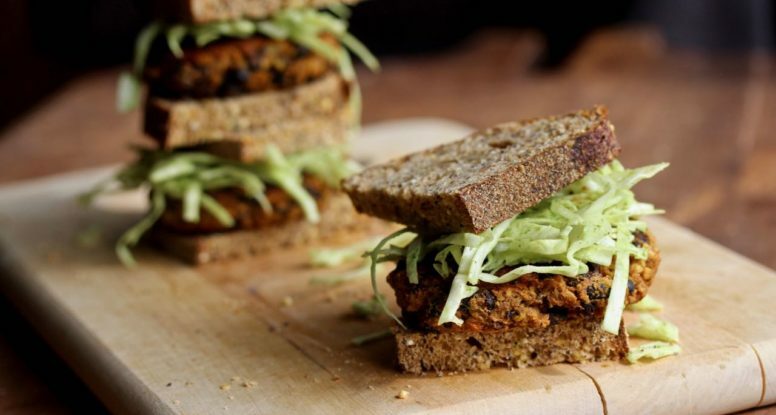 Enjoy a fun, nutritious twist on veggie burgers with these Chipotle Pumpkin Black Bean Burgers. Place the beans in a bowl along with the pumpkin puree, garlic, chili, salt and pepper. Mix and then mash with the back of a fork. Stir in bread crumbs, oats and almonds. Scoop mixture in slightly packed 1/4 cup portions, then shape into patties. Heat a large non-stick skillet over medium heat. Add the oil and once hot, add the patties and cook 6 minutes. Flip patties over and cook an additional 6-7 minutes or until golden brown and warm througout. Place burgers on buns and top with cabbage slaw. In a blender or bowl of a small food processor, combine the cilantro, olive oil, water, garlic, salt and yogurt. Puree until smooth. Transfer to a bowl. Place the shredded cabbage in the bowl and toss to combine. Any extra burgers can be frozen in freezer-safe bags or storage containers. WOW – Sara this is a wonderful recipe! Not only is that photo just calling my name, but the flavor combination sounds great! I have 1 can of pumpkin left- I think I know what it needs to be used for! That a girl and thanks so much for the love! These burgers look so good! I love all of the flavors and it’s a great way to use up extra pumpkin. Can’t wait to try it! Thanks so much Marisa! And I agree, an awesome way to finish up that can of pumpkin! Love the flavors using pumpkin and almonds!! Can’t wait to make this for a post run lunch or dinner!! It’s a pretty satisfying burger – a great post-workout meal for sure! Yum, these look fantastic! I love making homemade veggie burgers, the only way to go! Love how you’re using canned pumpkin, great idea. 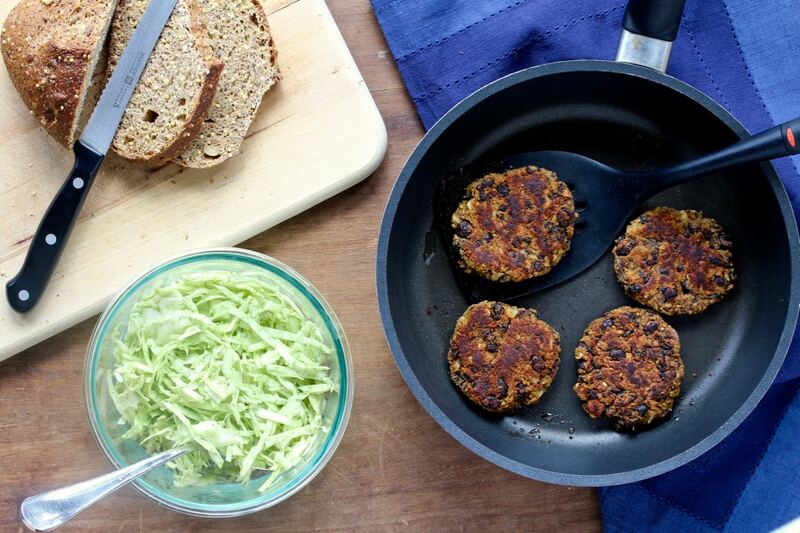 Love your tips for making bean burgers wonderful!! I feel like the flavors in this dish would convert anyone! Yay! Thanks so much Tara! Everyone should love veggie burgers, right? These sound delicious. Great idea using nuts and seeds to add crunch.